Are you in it to win it? There is a major difference between short term and long term goals. If you want to have a movie star smile, you might want to rethink your strategy. Quick fixes will not last a lifetime. They may not even last a year. While Crest Whitestrips are affordable and great for touch ups, if you want permanent white teeth for the rest of your life, KöR Whitening Deep Bleaching™ System is the way to go. KöR Whitening is the most effective in office tooth whitening system. KöR Whitening will require you to wear trays filled with whitening gel while you sleep. The trays are custom fitted so that the bleach is sealed within the tray and cannot ooze out into the mouth or mix with saliva. The hydrogen peroxide gel will break down if mixed with saliva, thus not allowing enough time to sit on the teeth and work its magic. By wearing the gel trays while you sleep, you don’t have to think about wearing them, or remembering to wear them, during the day. Oxygen is a necessity (I dare you to disagree). Without oxygen, we cannot breathe. It’s the element that sustains basic human life. It also plays a vital role in the KöR Whitening process. KöR Whitening restores your teeth’s ability to absorb oxygen. The more oxygen that is absorbed deep within each tooth, the more stain molecules are dissolved. Who doesn’t love perks? After completing the KöR Whitening Deep Bleaching™ System, you will be able to continue drinking typical staining beverages such as coffee, tea and red wine. Over a span of only two weeks, you will never have to worry about your teeth losing their sparkle. After three visits to Dr. Emery and less than two weeks of sleeping with trays in your mouth, you will have the whitest teeth of your life. As whitening is one of the most top requested services in the field of cosmetic dentistry, Dr. Emery and her team at Sugar Fix Dental Loft are no strangers to hearing from patients regarding this treatment. 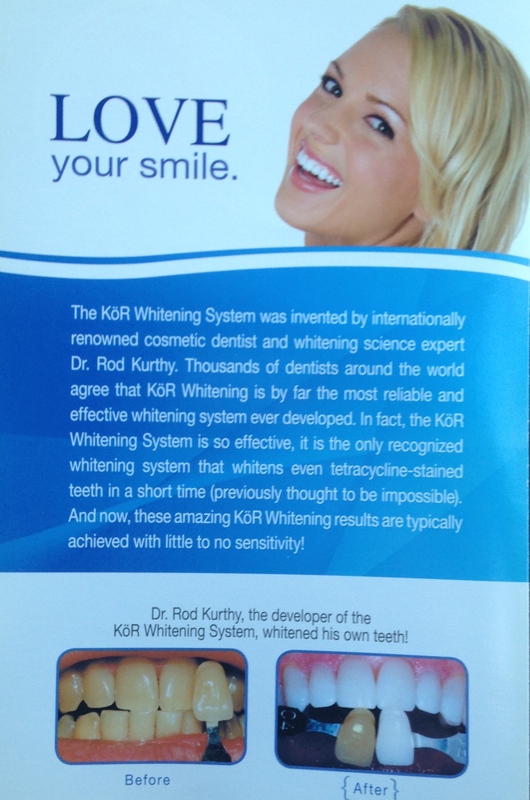 Call Sugar Fix Dental Loft today to inquire about the KöR Whitening Deep Bleaching™ System. You will not regret it. No more drugstore runs to pick up whitestrips ever again. Now doesn’t that sound nice? One less thing on that never-ending to do list.